Don't you just love it when a work can engage an older child and a younger child at the same time? Many Montessori materials lend themselves to work at different levels, and the Geometric Solids are a good example of that. The other day I asked my 8-year-old daughter to keep Alleluia busy while I made dinner. 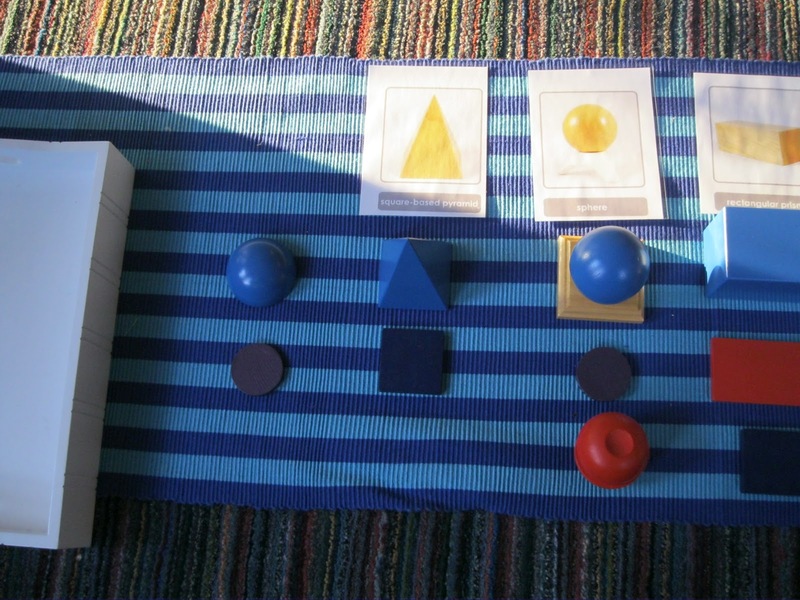 I got the two started with the Geometric Solids (the blue 3-D shapes you see in the photo above) and some laminated cards with the name of each shape. But then we noticed that a different work, one that uses wooden shapes that are flat, could be used, too. Imagine the "footprint" or cross section each solid makes and you can match 3-D solids to 2-D shapes. This was interesting and even a little tricky--enough so to be engaging for the older sister. 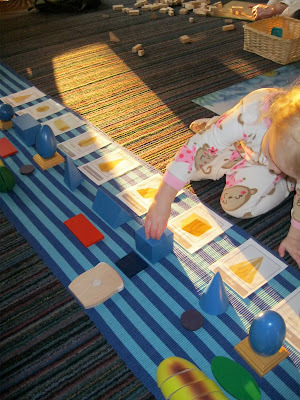 THEN we noticed that our play food set of wooden bread, carrots, apples, etc. roughly corresponded to the shapes we were working with! The apple is (roughly speaking) a sphere. Don't be afraid to use the word "sphere" -- they can handle it! 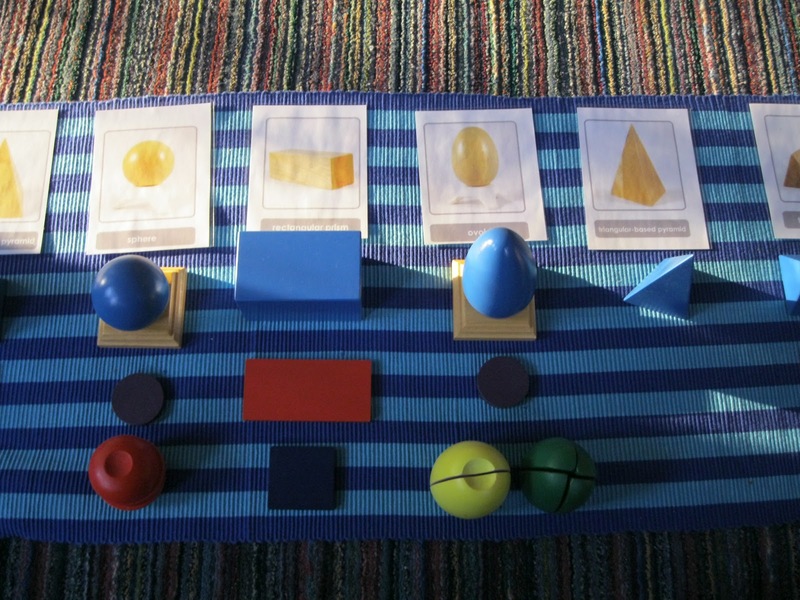 The solids can have different "footprints" depending upon which face they are "standing on." We only had a limited number of wooden shapes, but we could have easily cut some new shapes out of paper. We thought the avocado and pear were, roughly speaking, ovoids. By the time dinner was ready the angle of the sun was getting low and we had one last element to think about: shadows! By dinnertime the shadows were REALLY long! Interesting! Where would you suggest buying the geometric shapes? 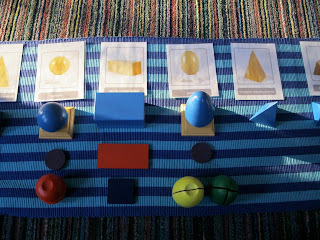 and there''s also Montessori n' Such. I truly cannot remember where I purchased mine!